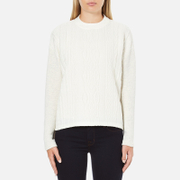 Women’s white sweatshirt with a woven cable knit front panel from Maison Scotch. Crafted from cotton French terry, the sweatshirt is finished with a high crew neck and a silver-tone back zip closure with a branded zip pull. 100% Cotton Model is 175cm/5'9 and wears a size 1/UK 8.